Buddy was a stray dog roaming the streets of Marietta, OH. Marietta is a small town of 15,000 people and downtown is small and quaint. I was having my snow tires taken off my car and decided to take a walk while the service center replaced my tires. It is always my luck that if there is a stray dog in town, it is always going to find me. Buddy, as we named him, was about six months old and wandering down the middle of Front Street without a care in the world. He was wet and had probably just been down to the Ohio River for a swim. The river is about one block from Front Street. Cars were stopping and trying not to hit him. Several people watched, but of course, no one took any action. My heart stopped a few times as he almost got hit, then I called for him to come to me. Sometimes stray dogs will come to you and many times they just ignore you. Buddy was a very friendly collie mix that must have loved people and he came right to me. I did not have a leash and at that time in my life did not realize that everyone carried a leash with them at all times if they wore a belt to hold their pants up. Someone found a piece of rope for me to use as a leash. Now what am I going to do with this dog at the other end of the rope? No collar, no ID tags and no dog license. 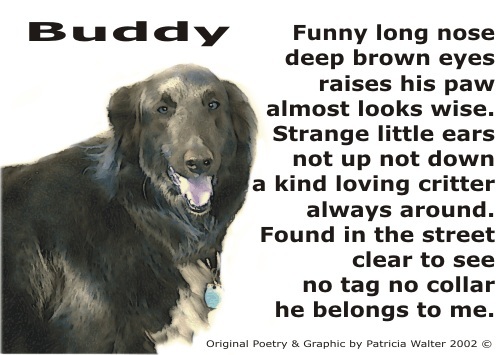 Obviously, whoever owned ( using the term loosely) Buddy did not care much about him or they would have taken the time to put an ID tag and a collar on him. Everyone on the street were being very vocal about not wanting or needing a DOG! We had six other dogs at the time and I kept saying that we already had six dogs and could not have another. I decided to walk him for awhile hoping his owner would show up. Of course, no owner was looking for him. I took him to the service center with me to pick up my car. Then I decided to take care of him since I did not know what else to do. I knew our shelter had a very bad reputation at the time and they killed many dogs. So I did not want to take him there. I was worried that if I did take him home, he might have a disease or illness that he could give to our other dogs since he was a stray. My older dog, Toby, was very sick with cancer and in his last days of being with us. I would hate to give him any additional problems from some illness brought into the house by a new dog. So I asked the vet if she would keep Buddy for a few days to make sure he was OK - a quarantine period. She said yes and I left Buddy with her. I went to visit him everyday and take him for walks and rides in the car. At the time, there was a very large outbreak of kennel cough in the area. It was a strange strain that was being passed all around town. Normally kennel cough was the main illness at the shelter and not normally passed around on the street from dog to dog. But there are many different strains of kennel cough. Most dogs, including ours, are vaccinated against kennel cough, but sometimes if the strain is different the vaccination offers no protection. Buddy stay with the vet for a full week. Then it was time to come home. Our family of dogs seemed to like Buddy and all went well as he made himself at home. He did get to meet Toby, our dog that was dying. It seemed that I had a tradition in my life to always have a black collie like dog. The first black collie mix dog that I had was another stray that my husband and I found in Columbus, OH. We were not married at the time and had taken a trip to the big city to enjoy the weekend. We found Casey wondering across a six lane street of traffic. My heart stopped when I saw him almost get hit. Then he proceeded to try to go inside one of the large stores. So I could see that he was lost and called him. He came to me. He also had no collar, ID tags or dog license. We were staying in a motel and I was not sure that we could keep him with us. He was about four to six months old. The motel clerk said he could stay in our room when I explained that I found him wondering the streets. I called the local shelter and they told me no one had reported him lost and it would be best to keep him. They were very full and he would probably not find a home if we left him at the shelter. So finding Casey in Columbus started the tradition of always having a black, collie mix dog in my life. Toby, the current dog dying from cancer, was adopted a short time before Casey died. They did know each other and got along fine. Now Toby was dying and he got to meet Buddy, the next black mixed collie dog in my life. I always tried to get photos of the dogs together. Toby only lived a few days longer after Buddy came home. We were very sad to lose Toby since he had been one of the best dogs we ever had. But we now had another black mixed collie in our lives. We had gone from Casey, to Toby to Buddy. I must be a magnet for black mixed collie dogs! About a day after Buddy came home from the vets, all of our dogs become sick with kennel cough. So my six dogs were sick and Buddy became sick too. Kennel cough is like a dog having a terrible cold with a cough. I had all of the dogs with runny noses and gooey stuff hanging out of them - really gross. Plus all seven dogs coughing their heads off. It was not a fun time in our house. The vet felt bad about all the dogs being sick even though they had all been inoculated against kennel cough and gave me free antibiotics for all seven dogs. She felt that Buddy had been exposed to the kennel cough when he stayed with her for the week. I guess I should have just brought him home, maybe all the dogs would not have gotten sick. All of the dogs got better except for Toby. The added strain of kennel cough along with his advanced cancer was too much for him and he died in the middle of the night. We were with him and did get to say good by. Buddy continued to do well with the doggie family and he become a welcomed member in our household. Buddy was very smart and I decided to take him to obedience school. He won a ribbon for being the second best dog in the class. Unfortunately, he could have been first, but decided to be silly when he was doing his sit stay. As he sat across the room from me, he kept wiggling his ears up and down during the "sit stay." He actually made me laugh and we lost points because he thought my laughing meant he should come to me. Oh well, it is good to have a comedian for a dog as well as a trained dog. Life with dogs can be very interesting and entertaining.